Virtual Tableau Training courses cover a wide variety of topics that range from beginner to advanced. Here are two more examples. Have a look! The above previews are a just small sample of the courses available. 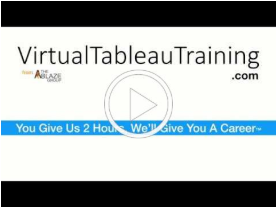 Improve your skills and job security with Virtual Tableau Training.